Teaching Fractions in KS2 - Some Hints, Tips and Ideas. Teaching Fractions so early in the UK national curriculum relative to our European neighbours brings some interesting challenges. Below are some ideas, hints and tips about how to introduce fractions to your pupils. A fractions wall helps children to visualise how fractions relate to each other in size. It’s a great tool to start talking about fractions. Ask questions – how many quarters in a half? How many eights in a half? Number lines can also be another useful tool when talking about and discussing fractions. Ask students to label fractions – a quarter, a half, three quarters -. Perhaps even advance to a 0-2 number line as sometimes seeing fractions in the larger context of integers can really help. 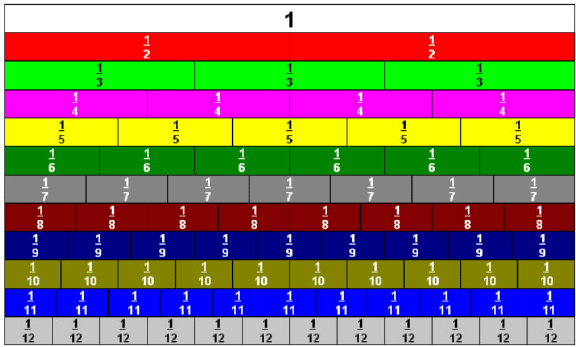 Combining a fractions wall and number line like the image here, can help things click! As you know integers, decimals, fractions even ratios are all different sides of the same coin. Understanding this, is key to maths mastery and fluency. Sometimes showing the same information but in a broader context can really help some children. Fractions are not things. They are not tangible objects. They are an adjective of quantity. Giving real life context for fractions is so important early on. Get children to use fractions in a sentence and then question what they meant. – I ate half a cake. What would changing the fraction mean? I ate a quarter of the cake. What does that mean in relation to the first sentence? If they can use fractions within English then they are starting to get a foundation. I am a firm believer that one of the issues with fractions is that they are presented prototypically. So when people talk about half a cake, they visualise a cut down the middle. Half a cake can also mean the half a cake after a dog has attacked a cake….simply a mess with bits missing from all over. Both are equally valid representations of half a cake and help distinguish about fractions being an adjective and not a noun.